Looking for the best socks for plantar fasciitis? You have come to the right place, so read on. Are you currently suffering from heel pain? It is likely that you sometimes feel the need to stretch your feet but the moment that you do so, the pain becomes even worse. You may have tried to do different things such as change your shoes, choose the right pair of sandals or slippers and maybe undergo various treatments just to make your feet feel better but after some time, the pain comes back. If you are dealing with constant heel pain that is worse in the morning and does not allow you to move that much, this is probably because you have plantar fasciitis. If in case you are not aware, Plantar Fasciitis is the inflammation of the Plantar Fascia which is the tissue responsible for aligning and giving support to the whole feet. The plantar fascia is often inflamed or strained because of having to stand up the whole day. If you are not sure if what you are experiencing is Plantar Fascia, it is the type of pain that you can feel at the bottom of the heel. Are you currently feeling some swelling and foot pain on the lower part of your feet? 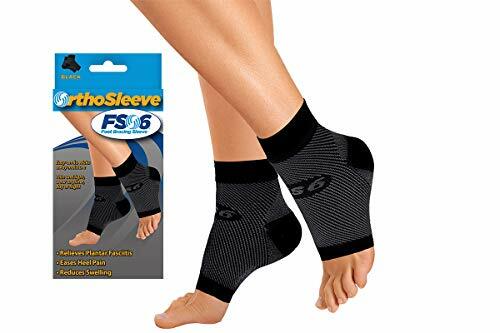 You may need OrthoSleeve FS6 in order to make your feet feel better. 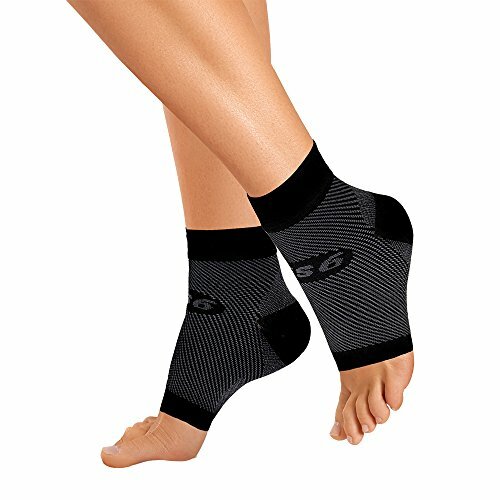 This pair of socks has a special feature called targeted compression wherein it will target the problem areas of the feet to help stop the bad effects of Plantar Fasciitis such as swelling and arch pain. Those who have always have had horrific pain felt not only on the heels of their feet but also their ankles can find this product amazing because it can make the pain go away after some time. Do remember that while immediate relief will be felt upon wearing the socks, wearing this pair of socks continuously will make the pain go away eventually because of the ample amount of support that it can give. You are recommended to get more than one pair so that you will always have a clean pair available when the other pair needs to be washed. Worried that the pair of socks that you are going to get will start to smell after being used for some time? 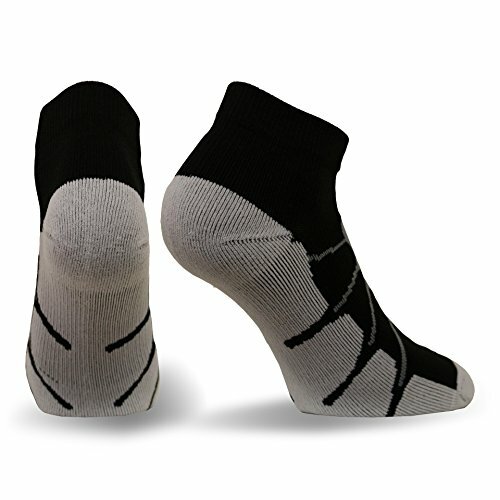 No need to worry about that with the Sox Sport Plantar Fasciitis Arch Support Ped Compression Socks Pairs because of its Silver DryStat system, the socks will be quick drying and it can be odor resistant too. While wearing this pair, people cannot be sure what makes them work well but the support starts from the start of the sock all the way to the foot. This can be worn before going to bed and you will be surprised that in the morning, you will not feel any pain. This can also be worn with almost any type of shoe and can be worn before doing any kind of task. The Sock Lock Support System of Feetures! 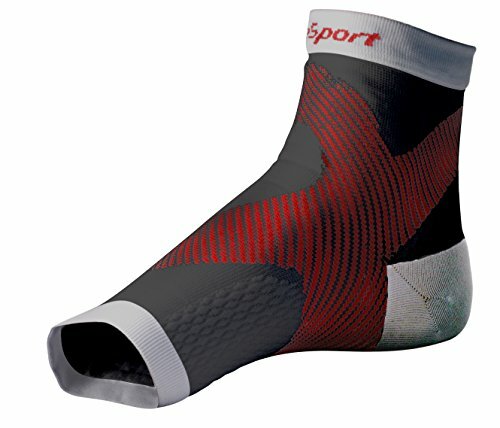 Makes it possible for the foot to become fully supported by the sock to the point that it will feel like the sock and the foot feels like they are one. The sock is made with silky soft rayon made out of bamboo and merino wool. These are enough to ensure that these socks will be totally comfortable. You might be turned off by the fact that this is made out of Merino wool but you should know that you are not to worry about anything since they can never sweat or feel uncomfortable. No need to worry about how long it would take before the socks dry out because when you hang them to dry, you can be sure that they will dry out after some time. Just make sure that you buy the size that will give you the best fit to be sure. If you have long been suffering with pain caused by having plantar fasciitis, this might be the right socks for you to wear. Imagine being able to walk going to work or to walk from work without feeling any type of pain because your feet are fully supported, this is what SureSport Ultra 8 Compression Foot/Ankle Sleeve can do for you. Whether you only need this product in order to give your foot full support when you are exercising or you would need something that can help get rid of the pain brought about by various foot conditions, this is guaranteed to work. You may have a bit of a problem if your foot is swelling simply because the sock will not fit. Just wait for the foot to become less inflamed and this might start to work effectively. Heel pain can be such a problem especially if you would have to stay on your feet the whole day. Instead of trying to go to a therapist in order to relive the pain, what if you would be told that the right pair of socks can work just as well? 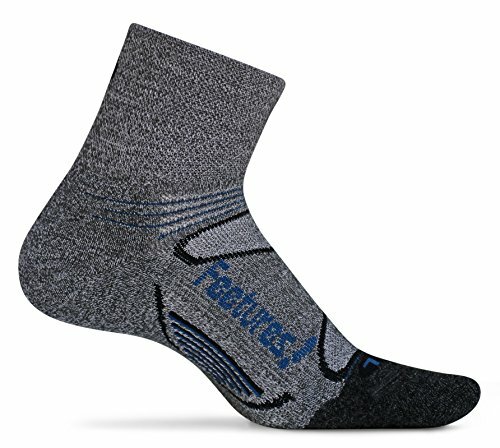 Feetures Plantar Fasciitis Socks might be the pair that you need to let you do what you have to do throughout the day. While other pairs of socks may be hard to put on, you can be sure that when you need to, you can place this on your feet easily. You can also remove them easily so you will not have any problem with this. You may want to order more than one to be sure that you can wear socks 24/7. It does not matter whether you are only feeling pain on one of your feet or both. What matters is that Feetures Plantar Fasciitis Sleeve can make the pain go away. Wearing socks that are not made up of cotton and nylon can be very hard to wear so do not look any further and just check out Feetures! Elite Light Cushion No Show Tab Sock. The Sock – Lock Support System is in charge of giving enough cushions for that extra comfort that people would need to make the pain go away. Having trouble with socks that keep on sliding away from your foot? The design of this pair is enough to make you want to wear it with almost any shoe because they will never slide. This pair also has iWick fibers which make it possible to be washed and become dry in a short period of time. No need to worry about having no support for your feet because the moment that they are clean again, you can wear them in a heartbeat. Better option is to purchase another one so that you do not have to rush dry the other one. It is possible that the plantar fascia has started to hurt because of wearing the wrong shoes, slippers or sandals. People who are flat footed can also have higher chances of having this condition because there are no standard arches that can help the feet balance. Those who are obese and people who do not get to exercise often can also suffer more from this condition compared to people who regularly exercise and are at the right weight. People with Plantar Fasciitis usually complain about heel or complete foot pain throughout the day although the pain can get worse in the morning. There are even some who are unable to prepare immediately because their feet are hurting so bad that they can barely get up. Stretching the feet can be very nerve wracking. It is likely that the first thing that you will think about once you are diagnosed with plantar fasciitis is to seek treatment immediately. You do not need to undergo surgery unless you have a ruptured plantar fasciitis. If in case you would like to know more about the various treatments, here are some that you can consider. First, you may want to consider Extracorpeal Shockwave Therapy or EWST. It is known to give pain relief up to about a year after the 3 month procedure has been done. After a year, another treatment would have to be done. Another option that you can undergo is Cortiscosteroid injection. It is known to make the pain because of plantar fasciitis go away for about a month or so. When the pain comes back, another shot of the injection is needed. Do remember that not all people find this treatment effective though so you may want to try another treatment. Another treatment that people are considering is plantar iontophoresis. This type of treatment involves placing topical creams on the heel of the feet and the substances will be moved to go inside the skin with the use of electrical current. There are times when these splints may work but some people find them very uncomfortable and they find it hard to sleep at night whenever they use splints. The next option would be to use the right products and wish that the pain will go away eventually but what if this is actually possible? What if all you would need are shoes, sandals or socks that can provide your feet with the support that it needs? It is likely that you would like to get it. There are several reasons why your feet may be hurting because of the shoes, slippers or sandals that you are wearing. For instance, your feet may be hurting because you are wearing the wrong size. No matter how cute the shoes are, if they do not fit you because they are too small, you should not buy them. It is possible that they will only hurt your feet. Another reason is that your feet are wide and you are trying to fit them into narrow shoes. Your feet will not adjust to the shoes and this will cause not only your plantar fascia to hurt but your whole foot. You may even have blisters as a result. Your main goal when searching for the right shoes should be searching for that pair that will make you stay comfortable the whole time that you are doing your job and if you cannot find the right pair of shoes, maybe you should find the right pair of socks instead. Have fun browsing and checking out the various socks available. You may never know, you might want to purchase more than one pair. If you are think that you are going to have Plantar Fascia for a long period of time, this is not true because most of the time, it is a condition that heals itself and goes away over time provided that you do not do anything to prolong it. It is quite apparent that there are different brands of socks that you can choose from. These pairs of socks are all proven to have received good reviews from people who have used it. Do remember that it does not necessarily mean that because a sock did not work well for one person means that it will not work for you. Gauge your options and make a decision. If you would choose wisely, you will benefit a lot from it. The best plantar fasciitis socks are socks that can make you do all the things that you have always wanted to do such as indulge in more physical activities, go to work and go home from work with ease and to not wake up with any type of pain in the morning. Experiencing those things will not be a dream anymore. They can truly happen when you wear the best plantar fasciitis socks for you.